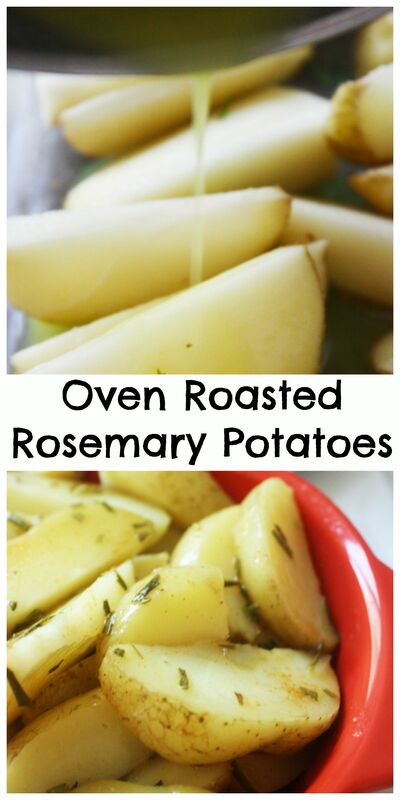 Oven Roasted Rosemary Potatoes is one of our favorite potato recipes. We tend to make them more in the warmer months when we have fresh rosemary growing in our herb pot in our backyard . We usually make them in the oven but if we are grilling chicken or hamburgers, we will put these on the grill also. They cook well either in the oven or on the grill. 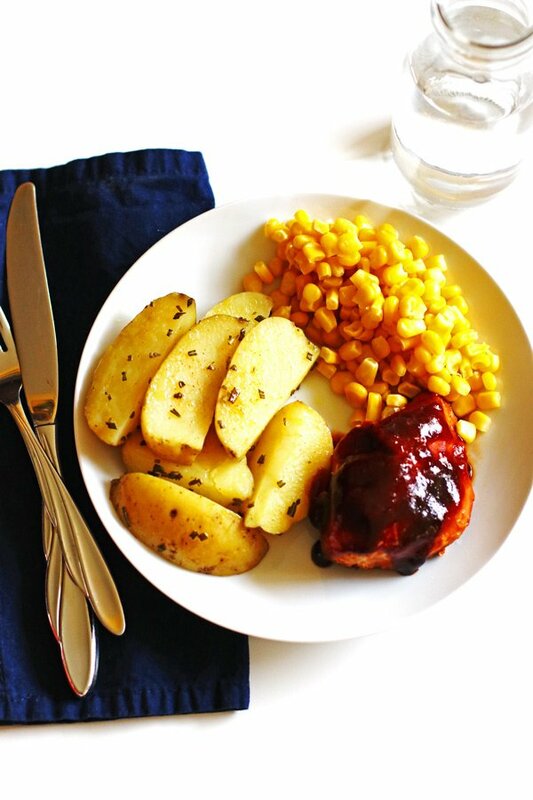 This is a quick and easy recipe to make which is always a good thing in my book! And the flavor is sooo good! The fresh rosemary gives such an amazing taste to the potatoes. 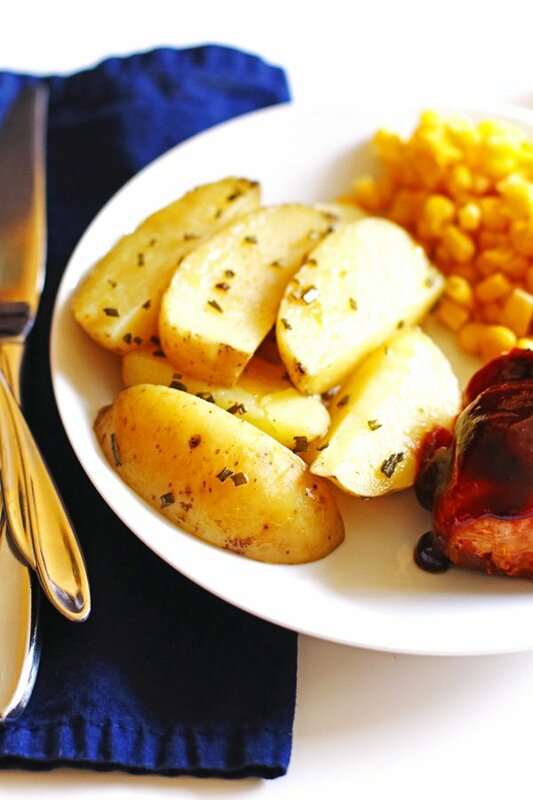 So here is how to make these delicious potatoes… Preheat the oven to 400 degrees. 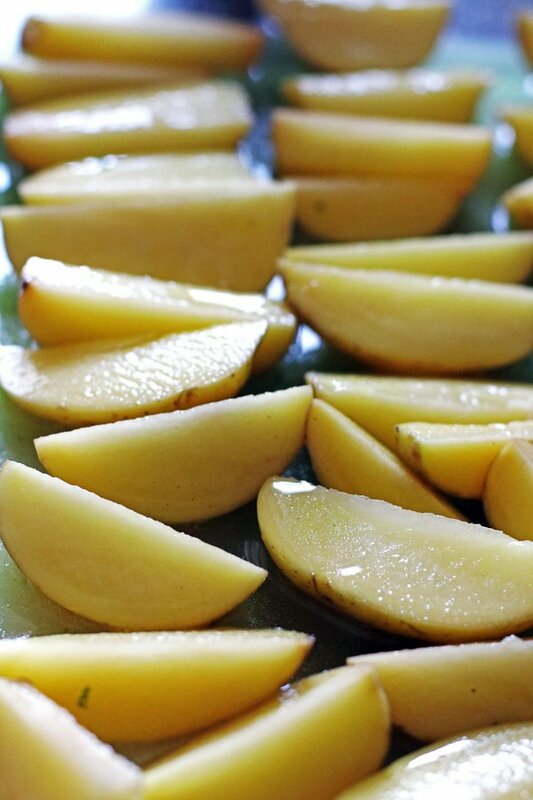 After washing the potatoes, cut them into thin wedges. I cut them into quarters and then cut each one again. Place them skin side down in a 13×9 baking dish. Make sure there is a little space in between each potato wedge. Then place the butter, water and bouillon cubes into a small pot. Bring to a boil, stirring often until the butter is melted and the bouillons are dissolved. Pour the mixture over the potatoes making sure they are all covered. To make sure the potatoes are covered well, I dip the potatoes in the butter mixture once in the pan to coat them with the butter mixture and then stand them back up. Sprinkle the Lawry’s seasoning salt over the potatoes and then the chopped fresh rosemary. Cover tightly with foil and bake for 30 – 40 minutes in the oven. If cooking them on the grill, place them in a foil pan and cover. Grill on medium heat, about 350 degrees, for 40 minutes or so. They are done when the potatoes are tender. 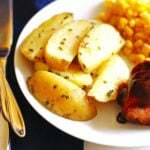 Wash and cut potatoes into thin wedges and place them skin side down in 13x9 baking dish. Place the butter, water and bouillon cubes in a small pot. Bring to a boil, stirring often until butter is melted and the bouillon cubes are dissolved. Pour over the potatoes, making sure all the potatoes are covered. Sprinkle the Lawry’s and rosemary over the potatoes evenly. Cover and cook 30-40 minutes.